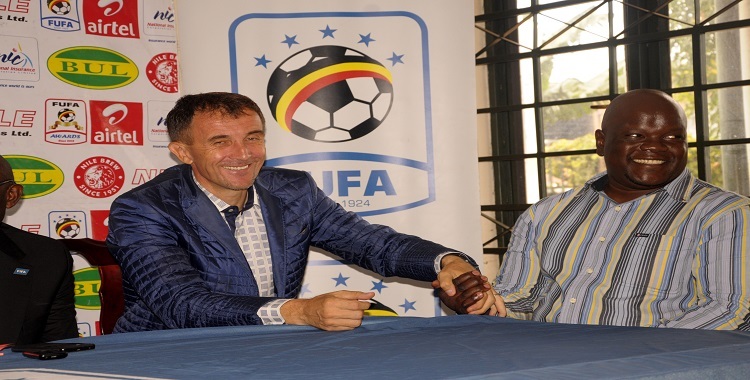 Among local soccer fans circles, the talk of Uganda Cranes featuring in the FIFA 2018 World Cup has hyped after the home side acquired maximum points following the 1-0 victory against Congo Brazzaville on Saturday, 12 November 2016 at Mandela National Stadium, Nambole. The only goal for the day arrived at 21st minute thanks to Farouk Miya who notched from a close range after a lot of collisions and hurdles. This now implies that the Cranes are on top of Group E with four points although Ghana is set to play with Egypt on Sunday, 13 November 2016, a fixture for the same group. A great applause from the fans was later heard after the home side took the lead. Prior to the match, most fans were in hot soup after the Cranes easily dropped points in a friendly match against the Zambia Chipolopolo stars on Tuesday, 08 November 2016 in what was believed to be a build-up match. A handful of fans turned up for the tie as witnessed by the empty stands. None the less the sparsely populated crowd afforded to give the home side a nice rhythm lead by usual cheer leaders that flamed the entire fan base. Robert Odongkara returned to the posts after a long spell following the absence of first choice number one, Denis Onyango who is currently injured. He was rarely tasted but made two brilliant saves to prevent the visiting side from notching. A lot of lads impressed for the home side with the likes of Nicholas Wadada taking charge of the back line not forgetting when he made an incredible tackle before the break that denied Dzon Delarge to level matters. Farouk Miya the goal scorer was out standing with good movement and composure and also devoted to take on the opponent. Tony Mawejje, Aucho Khaled, Moses Oloya, Geodfrey Walusimbi and debutant Michael Azira all impressed for the Cranes. Skipper, Geoffrey Massa broke his promise of ‘’breaking the net.’’ It should be noted that prior to the fixture, Massa had told the media that ‘’I will break the Congolese net again’’ but on the sad note, this promise did not come to pass extending his goal drought to almost a year. All said and done, the biggest question now is whether the Uganda Cranes will hit the road to Russia come 2018 despite the remaining fixtures which prove to be an uphill task.